See Fellowship of Humanity vs. County of Alameda. 153 Cal. App. 2d 673 (1957), cited with approval by the US Supreme Court. It is, so far as I am aware, the leading case on the government’s ability to inquire into the validity of a religion (p.s. : it doesn’t). 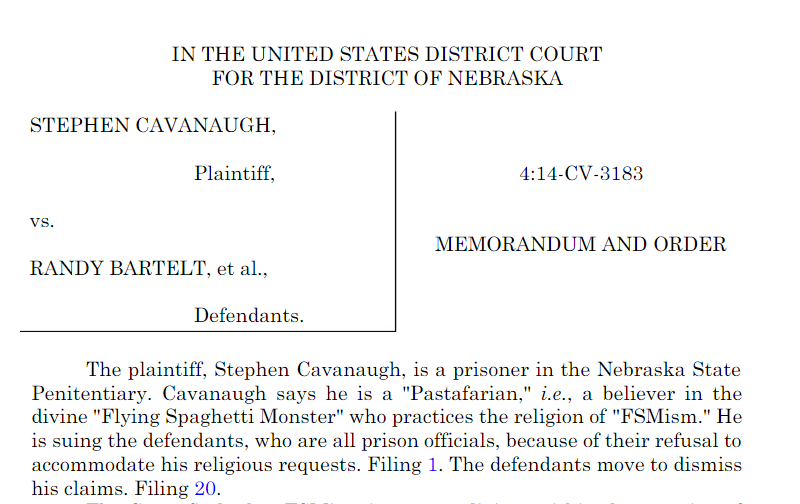 The Nebraska federal court ruling is direct contravention to the holding of Fellowship of Humanity, and therefore subject to almost certain reversal on appeal. RJ, great stuff; religionists can’t have laws for themselves that don’t, as they would like, apply to others. Also, I believe they get tax breaks of about $18 billion per year, lost from your country’s revenue, better spent on social services, than pastor’s Lear Jets and free bibles. Dear Robert, weel said. It’s good to have experts on this blog, in subjects beyond fornication, eating and drinking. But will it be appealed? RJ, thanks so much for your contribution. It’s anyone interested in helping this guy to file an appeal with representation? Not from me, ryan. Too busy fornicatin’ and drinkin’.